Part of the fun of walking a large trail like the Bay Trail is that there are additions and changes constantly underway. Today's walk took place on a wonderful new stretch of trail that extended (from a parking lot at the end of Eucalyptus) out to the Napa River. 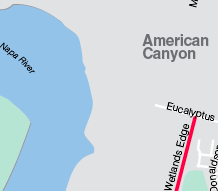 The new trail was located in the gray area on the map shown at right; and it was not yet in existence when this Bay Trail map was created. My understanding is, in the future, new segments of trail (also not shown) will join other segments further north. This new area was beautiful. After walking along rural highways and grapevines (as beautiful as they can be) for the past few months, I was delighted to walk near the water again. And there was a great deal of wildlife to see on this walk. In addition to areas of water (ponds, Napa River - Bay), interesting sights included: lots of large birds, including some white pelicans, hawks, and vultures; some large agave (century) plants in bloom (pictured at right); and a boat that had apparently worked its way loose of its moorings and washed ashore (also pictured, right). We also saw a colorful lizard (with some blue coloring) on a tree (bottom right). I had too many photos from this walk to post here, which is usually a nice problem to have. Thank you to Margaret and Albert for joining me on today's walk, and to Johnny and Tony who gave us some additional helpful information on the new trail as we walked in. 7 butterflies (5 white, 2 yellow and black); 5 snowy egrets; 3 hawks; 6 turkey vultures; 3 lizards; 36 red-winged blackbirds; 24 little brown jobs (LBJs); 1 ground squirrel; 9 dragonflies; 2 great egrets; 6 swallows; 2 killdeer; 4 unidentified brownish shorebirds (UBBs); 2 white pelicans; 15 ducks; 20+ sheep (in distance - "mowing" grass). Before driving home this evening, I couldn't resist taking this very short stroll down American Canyon Road West, located in a suburban area. It was dark, but there were street lights; and I walked (on a sidewalk) West on American Canyon Rd. from Elliott Drive to Hummingbird Way. This Road leads out to Wetlands Edge, and a new segment of the Napa River and Bay Trail, that I plan to walk tomorrow. Note: It was too dark for pictures. 1 (domestic) cat running into some bushes; and a dog out for a walk with its owners. It was too dark to see anything else. I took a detour from the more heavily trafficked Highway 29, to walk up North Kelly Road (shown as a white line "Kelly" on map, and which runs parallel to Highway 29 -- shown as the double yellow lines on map). I left Highway 29 at Jameson Canyon (Highway 12) and walked North on N. Kelly until it rejoined Highway 29. The West side of N. Kelly Road was populated by light industrial and commercial buildings, belonging to Sutter Home and other wine-related businesses; and the East side of the road was more open land, that might have been a mix of pasture and vineyards. I finished this stretch of road after the sun had set, so there weren't many opportunities for pictures; however, it was a pleasant walk. 20 blurs in the grass/bushes (there was more movement and more blurs as it got darker, so I'm assuming these were field mice); 8 swallows; 1 mockingbird; and then it became too dark to see much more. This afternoon, I stopped at Ristorante La Strada (shown), on the Bay Trail, on Highway 29. The Highway is shown as double yellow lines on left side of map). After a late lunch, I headed North, walking along Highway 29, until I reached the intersection with Jameson Canyon/Highway 12. Even though this stretch of Highway 29 had a shoulder that was wider than some, setbacks along highways are not my favorite type of trail; and there were three sections of Highway 29 with guardrails (narrowing the walking area further) from the restaurant to Jameson Canyon (Highway 12). 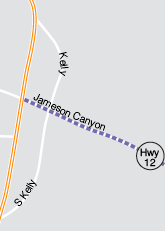 There was no easy pedestrian crossing at the intersection of Highways 29 and 12, and so instead of continuing to walk along Highway 29, I decided to head East on Jameson Canyon/Highway 12, to North Kelly Road (shown only as a white line on map above Jameson Canyon). Later this evening I would return to walk N. Kelly Road -- a road that parallels and then joins Highway 29 further North. The only other human I encountered on my walk up the Highway was a man in a car who asked if I needed help or a ride. I appreciated his concern, but assured him I was out walking by choice. On the animal and bird front, I walked by a cow pasture. I've found that cows are pretty wary of pedestrians. They're not used to seeing humans walking along highways, and they usually have kept an eye on me until I pass by. (See cow pictured at right.) I also was able to see two kites (birds), and was able to photograph one perched on top of a utility pole (see image at right). My apologies to the crickets I bothered, when I walked too close to the dry grass on the side of the road, causing them to leap by me toward the highway (not the smartest move they could have made). 15 cows; 10 little brown jobs (LBJs); 2 crickets; 2 crows; 3 screws; 2 white butterflies; 1 snowy egret flying overhead; 2 kites (engaging each other briefly in mid-air); 2 blurs in the grass/bushes (probably field mice). Before I left Napa area, I decided to drive back to Highway 121 to visit the di Rosa Art and Nature preserve, which had been closed when I passed by there previously. The entrance is modest, and it was a surprise to discover an impressive collection of artwork from local/California artists, located a few paces from the Bay Trail (across the highway from the intersection of Duhig Road and Highway 121/Highway12 -- close to the point where the double yellow lines meet the white line on map). If you are interested in visiting the di Rosa Preserve (an area that contains the former home of Rene and Veronica di Rosa, a Gatehouse Gallery, lake, as well as art -- sculptures, paintings, an art car), I recommend making reservations ahead of time for a tour, so that you can see some of the roughly 200 landscaped acres. The last tour had already departed for the day when I arrived this afternoon. However, it was possible to see the art in the di Rosa Gatehouse Gallery, where the check-in desk and gift shop is also located. The grounds and lake looked beautiful, from what I could see. N/A - although the fake sheep on the hill above the parking lot were fun. Labels: Highway 29, N. Kelly Rd. Once again I took advantage of mild summer weather, and walked after sunset -- in an area that had at least some street lights. This evening I also had a sidewalk to stroll down, which was a welcome change of pace. Uneven patches of dirt and gravel are less fun in the dark. First I walked West (toward the Baylands) on American Canyon Road (shown as double red lines on the map). I turned around when I reached the intersection with Elliott Drive, and retraced my steps, walking as far East as the intersection of American Canyon Road with Broadway (also known as Highway 29, and/or Napa Vallejo Highway). I have only one very blurry photo to post here. Putting my camera on a tripod would have helped. But, my primary objective was to walk down this street quickly; and I've made it a practice to travel light. So, the trade-off is -- no night photos to show. I balanced my camera on a wire fence to take this picture, hoping it might steady the shot. However, wire fences have some give to them. And, I ended up with a "painting" instead of a photograph. After pausing to speak to a police officer, who pulled over to find out if I needed any assistance, or if my car had broken down, I walked as far South as 5455 Highway 29 (aka Napa Vallejo Hwy.) near a waterfall/pond supplies company. I passed an auto salvage yard and other commercial businesses along the way, and watched a crescent moon rise in the sky. I walked as far North as La Strada (Italian) restaurant, just north of the intersection of Highway 29 and Tower Rd. I look forward to stopping at La Strada next time for lunch, as a starting point for the final leg of Highway 29 (parallel to N. Kelly Road and part of S. Kelly Road). On the walk back to the car, the sun was low in the sky, painting the hills a nice rosy color. After the walk, on my way home, I stopped to treat myself to some ice cream at the Country Creamery, in between Safeway and Starbucks at the American Canyon Market Place/shopping center. 4 rusty screws; 11 little brown jobs/songbirds; 1 fairly large flock of Canada geese; 8 snowy egrets flying in a group. From Kaiser Road parking space, I first walked North to the Kaiser Road sign, and then South -- to the intersection of Highway 221 and Anderson Road (to the East of Highway 221) and Napa Valley Corporate Way (West of Highway 221). Note: Neither of these end points are shown on the map insert at right. More vineyards could be seen on the hillsides. Red-tailed hawks have a very distinctive screeching cry (often used in television and film). Having heard this cry, I looked up to find I was fairly close to a red-tailed hawk who was perched on some bare limb of a large eucalyptus tree in the median strip of the highway. However, when I got close enough (even with this tree on the other side of the road) to try to take a picture, the hawk flew away. Animals and birds seem to be quite wary of pedestrians -- who are far more unusual than automobiles speeding past. And, when I see things like this mask (right), I guess I don't blame them. The closest I came to capturing any bird images today were these two very long shots: 1.) a great egret perched up on a hillside, and 2.) a turkey vulture spotted flying a bit later. Both are shown at right. 2 crows; 2 red-tailed hawks (around/in tall eucalyptus trees); 11 little brown jobs/songbirds; 3 blurs in bushes/dry grass; 1 great egret. This evening's walk took me from the North end of N. Kelly Road to Anderson Rd. (not shown on map), north of the Highway 29/Highway 221 split. What was most notable about tonight's walk? Was it the nice sunset? Or, the crescent moon beginning to rise, and the warm evening with the sound of crickets chirping? No, the most memorable aspect of this evening's walk was strolling by a mouse metropolis. Every few steps I would take, I would catch a glimpse of a mouse dashing into a nearby hole in the dirt and dried grass (examples shown at right). No wonder there were hawks circling above. This area was a veritable supermarket for birds of prey or mouse-loving mammals. The fact that this stretch of road was close to some of the few remaining open fields in this area helped explain why I was seeing an "intact ecosystem" with different kinds of predators and prey (although some were victims of run-ins with cars). I suspect if these fields disappear, the number of species will likely dwindle as well. The Hillside Christian Center complex off Highway 221/Anderson Road (the point where I turned around) is shown at right. Lots of Mice: 24 blurs in the dried grass/weeds (all probably mice); 3 dead mice + 10 live mice; 3 hawks circling above; 7 little brown jobs (LBJs); 1 screw; 1 crow; 1 dead gopher? snake; 1 unidentified dead bird or mammal; 1 dead squirrel; and 1 hubcap. I turned around at 5455 Highway 29 (a waterfall and pond supplies outfit). As I walked back, still feeling energetic, I took what I thought would be a shortcut. I turned Right on Green Island Rd. and then left onto a frontage road (Paoli Loop) that paralleled the highway. I thought it might lead me past a place I'd spotted earlier that had a sign advertising "honey for sale." Well, you know the rest...Never take a shortcut (especially a road with "loop" in the name), unless you have a detailed map with you, or you've researched this in advance. I walked about a mile more than I needed to by taking this loop road, but it was pleasant and scenic. It eventually took me under the overpass (picture lower right) that I'd walked on earlier (pictured above right), and then looped back to where I started before I took the shortcut - so I got to go over the overpass one more time, on the other side. Walking by the Napa Junction/Walmart more closely this time, I noticed that they had a nice broad asphalt strip (shown below right) for walking and biking in front of this development. Nice. Note: the gray dotted line (on map) was not the route that I took when I got "lost." (Please, people, give me some credit.) Instead the dotted line is a planned/proposed right-of-way, that may be approved as part of the trail system at a future date. 33 little brown jobs (LBJs)/songbirds; 3 blurs in the bushes; 1 snail (brown shell) hanging out near the highway; 4 sea gulls; 8 doves; and 2 swallows. From American Canyon Road (where double red lines meet double yellow lines on the map above right), I walked North on Broadway Street (Highway 29), crossing Donaldson. I turned around just North of the intersection of Broadway and Poco Way, near the Broadway Market and Caffino coffee stand. As I turned around to walk back, I thought to myself: Am I really seeing a very large gorilla over there? The answer was yes....And a bit further, there was a T-Rex too. If you squint very hard, you might be able to see these figures looming out of the darkness too. It was too dark to see anything; I saw the dim silhouettes of a large gorilla and a T-Rex dinosaur (large metal sculptures at a garden center). I listened to the sounds of a few birds and then crickets, along with lots of cars whooshing by me.